Sometimes it isn’t so easy to find out about some new deck or site, proposing unique and creative deck of playing cards. Even links to such places, mentioned in articles on this site, demand time to be find. “Playing Card Companies” page is dedicated to different playing card companies and information about them. Its main purpose is to be focused on companies (their history, activity), but not on playing cards produced by them. “Index: Reviewed Decks” page is in turn for those who want to read about a pack of playing cards reviewed on this site. At the same time, there are people preferring to get (order) and then to read. 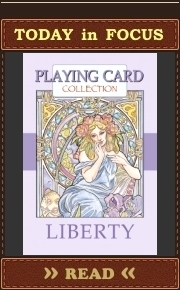 Also all collectors prefer to know about playing card contests or giveaways, what playing cards are coming up. So, this page should simplify the task for “hunters”. 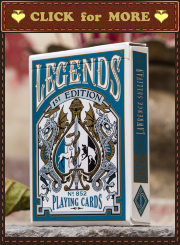 It consists of three main parts: “Upcoming Decks of Playing Cards”, “Playing Cards: Contests and Giveaways” and “Different Places to Find Playing Cards”. “Upcoming Decks of Playing Cards” part is represented by the banner on this page. Click on it to get into the necessary thread on PlayingCardCollector.net (this is caused by some technical optimization of the site). “Playing Cards: Contests and Giveaways” part is represented by the banner on this page. Click on it to get on the necessary page of PlayingCardCollector.net (this is caused by some technical optimization of the site). 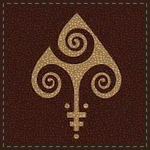 “Different Places to Find Playing Cards” is a special list stated on this page. It names some appropriate places proposing different playing cards. Pages (threads) are updated whenever possible and aren’t comprehensive lists/databases. PlayingCardCollector.net isn’t responsible for sources of information and possible inaccuracy; sites (on-line pages, stores, etc.) to which the links lead.